Apple delivered its keynote address on the iPhone 5 today. Here are the major updates and coolest feature about the world’s most anticipated phone to date. The rumors that we’ve heard for some time now are true. The iPhone 5’s screen is 4 inches tall, half an inch taller than previous iPhone’s. The width is the same, which gets us closer to watching widescreen movies in their native 16:9 dimensions. It contains a 326PPI Retina display, with 1136 x 640 resolution. The taller display now gives us room for five rows of apps. The iPhone 5 is made entirely of aluminum and glass. It is the thinnest and lightest iPhone yet, coming in at 7.6mm thick, which is 18% thinner before. It weighs 112 grams which is 20% lighter than the 4S. Apple has not forgotten the fact that the iPhone is…well…a phone. Their dynamic antenna can automatically switch antennas, similar to how the 4S works. The iPhone 5 will support LTE, from US carriers including Sprint, AT&T and Verizon. The iPhone contains an A6 processor. The new chip performs twice as fast as the A5 chip in computing and graphics processing. The chip is 22% smaller and more energy-efficient too, which is good because it remains to be seen how Apple plans on powering all of this stuff. According to Tim Cook, the battery in the iPhone 5 not only matches, but exceeds the battery life of the iPhone 4S. It provides 8 hours of 3G or LTE talk time/browsing and 10 hours of WIFI browsing. The camera on the iPhone 5 is the same as the 4S; 8-megapixel sensor, 5-element lens with an f2.4 aperture. It is thinner however, and there is a new low-light mode feature; the sensor will evaluate pixels in the image and improve low-light performance by up to 2 f-stops. There’s also a new sapphire crystal lens cover. One of the coolest new features with the iPhone camera is the panorama feature. Now you can just sweep the scene vertically, to get the most resolution, and swing your phone. The camera responds by giving you a 28-megapixel panoramic picture! Video on the iPhone 5 is still 1080p, but it now has facial recognition and better video stabilization. The front-facing camera is now 720p, and illuminated, meaning we can have much clearer pictures of ourselves for our Facebook profiles! FaceTime will not be limited to WIFI anymore, as it is now available over cellular networks as well. The iPhone 5 has three microphones; front, bottom and back. This will provide much better voice recognition for phone calls, dictation and apps like Siri. It also has what Apple is calling “wide-band audio,” which is basically a wider spectrum for audio, resulting in voices sounding more natural during calls. Carriers will have to support the feature and so far 20 carriers will. The new connector is an 8-pin, all digital connector called Lightning. It is reversible so you can plug it in either way, and is 80% smaller which makes a huge difference when creating the world’s thinnest smartphone. Don’t throw out your old accessories just yet, companies including JBL, Bose and B&W are already working on adapters for them. iPhone 5 will get a brand new iOS, namely, iOS 6. You can now share Safari’s tabs on your desktop with your iPhone using iCloud Tabs. Mail gets an upgrade too, as you can now flag messages for follow-up, or mark people as VIP, which will provide them with their own inbox. With Passbook users can book flights, movie tickets or get coupons all with the touch of a button. 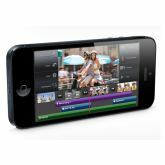 It is now possible to have Shared Photo Streams with iOS 6, and Siri is new and improved, thanks in part to the three microphone system the iPhone 5 employs. No more Google maps. Now the maps app will give turn-by-turn directions with Siri’s voice to guide you. It has satellite imagery and a flyover mode, which has satellite imagery draped over a 3D map of the city. It’s like you’re flying, cool! Now where am I? No wireless charging, no micro-USB compatibility, no NFC and no Bluetooth 4.0. But hey…that’s what the iPhone 6 is for! All prices given here are on-contract pricing. A 16GB iPhone 5 will cost $199; 32 GB will cost $299 and the 64GB model will cost $399. The iPhone 4 will now be free when you sign up for a new contract, and the iPhone 4S will now cost only $99. Pre-orders for the iPhone 5 begin on Friday, September 14th. Shipping to the US, Canada, UK, France, Germany, Australia, Japan, Hong Kong and Singapore will begin on September 21st.